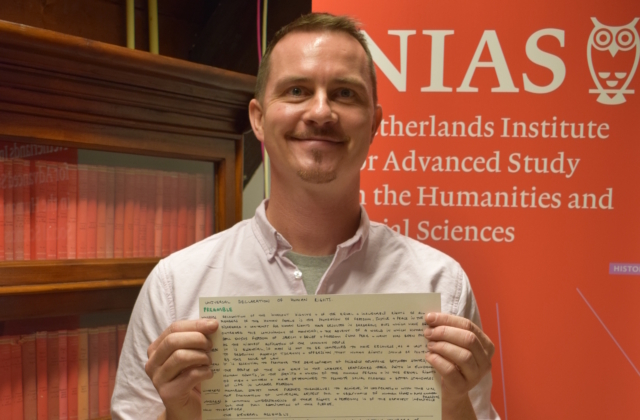 On 10 December 2018, current Fellow Aidan McGarry organised an ‘introvert’s protest’ at NIAS with a group of students, activists, artists and scholars, celebrating the 70th anniversary of the Universal Declaration on Human Rights. By handwriting the Universal Declaration, they reaffirmed their commitment to a document that can be rightfully described as one of humanity’s greatest achievements. The Universal Declaration on Human Rights celebrated its 70th anniversary on Monday 10 December. The Declaration was proclaimed by the United Nations General Assembly in Paris on 10 December 1948 as a common standard of for all peoples and all nations. Born out of the atrocities of World War 2, it set out for the first time, fundamental human rights to be universally protected. The Declaration has been translated into over 500 languages, making it the world’s most translated document. The Universal Declaration on Human Rights has inspired more than 80 international human rights treaties and declarations, a great number of regional human rights conventions, domestic human rights bills, and constitutional provisions. It promises all the economic, social, political, cultural and civic rights that underpin a life free from fear. These rights, significantly, are not dependent on states, or particular to a certain era or social group. They are the inalienable entitlements of all people, at all times, and in all places – irrespective of race, gender, ability, age, sexual orientation, religion, and apply to citizens, refugees and migrants. This 1780 word document can be rightfully described as one of humanity’s greatest achievements. 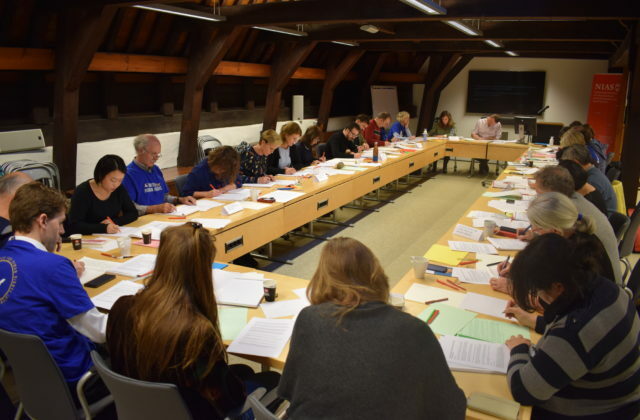 To celebrate this historic event, I organised an ‘introvert’s protest’ in Amsterdam at the Netherlands Institute for Advanced Study with a group of students, activists, artists and scholars. We gathered to handwrite the Universal Declaration, word for word, start to finish. We came together silently and individually hand copied the document to remind ourselves that these rights have been defended time and again through this standard. This ‘introvert’s protest’ invoked the principles underpinning the Universal Declaration at a time when freedoms and human rights are being squeezed and violated across the globe from the USA to Russia, from Hungary to Saudi Arabia. We wrote out the Universal Declaration in English, Chinese, Russian and Dutch. This protest helps to ground us and reminds us of the importance of the UN Declaration of Human Rights as more than just words arranged on a page. Their meaning is much more significant. This protest was a quiet performance, done collectively, which resonates with the individual human whose basic provisions and protections are enshrined in the document. It is inspired by a global project created by an artist who believes the pen is mightier than the sword. In January 2017, as the inauguration of Donald Trump neared, New York-based artist, Morgan O’Hara felt the need to protest. As a concerned artist, she had marched many times, but this moment seemed to call for something else. She wanted stay clear of the campaign’s toxic excesses, and take action silently. On Jan. 5 2017 she woke up with the idea of copying the U.S. Constitution by hand. While she often hand-copies texts as part of her art practice, she hadn’t thought much about the Constitution before. She only knew she wanted to do it, and to do it with others in a public space. On Inauguration Day she went to the New York Public Library with a small suitcase of pens, a few Sharpies, papers and copies of the Constitution. She brought old notebooks, half-used drawing pads and loose sheets to share with anyone who might show up. She began writing. To date she has organized 85 sessions around the world. ‘Handwriting the Constitution’ (www.handwritingtheconstitution.com) has been taken up in many states in the United States, as well as in Italy, Israel, Germany, Taiwan, Portugal, and now, the Netherlands. In each case, people handwrite their chosen documents written to protect human rights, which could be a constitution, a bill of rights or the Universal Declaration on Human Rights. O’Hara organized a New York session on Monday 10 December at the Carnegie Council for Ethics in International Affairs to handwrite the Universal Declaration for Human Rights. 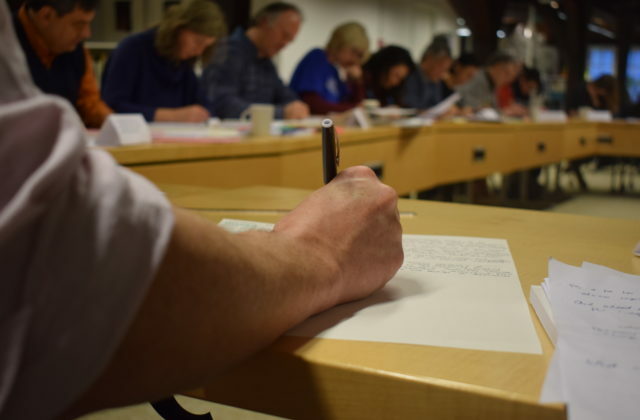 Morgan O’ Hara describes this as an ‘introvert’s protest’ and believes that the act of handwriting is very important, ‘writing is very different from reading and typing. When you write something out it somehow gets into your head and your body in a more profound way.’ The philosopher Walter Benjamin argued that ‘the power of a text when it is read is different from the power it has when it is copied out’ believing that when we handwrite a text, ‘we submit to its command’, we understand the acute struggle to assemble those words on a page, and affirm their continued importance. Marching, chanting and demonstrating is not for everyone. But an introvert can write something, solo and quietly, and it can be an act of protest. By handwriting the Universal Declaration, we remind ourselves of the struggle to create this document and reaffirm our commitment to these basic protections afforded to every human, irrespective of where they live. This introspective activity is carried out by an individual but enjoyed in respectful community with others, echoing the central premise of human rights. The Universal Declaration on Human Rights is more important than ever because of persistent human rights violations. Handwriting the Universal Declaration will not halt torture and human trafficking, the arbitrary imprisonment of academics or the extra judicial killing of journalists, but our introvert’s protest quietly reminded those participants, what rights we, as humans have, and what we deserve.